CoilyQueens™ : Help my hair is shedding! Shedding is a normal stage your hair naturally goes through on a daily basis. People shed between 50 to 150 strands per day. Around 15% of hairs on your head are in the shedding phase daily. The majority of your hair is in the growth phase at all times. How do I know whether my hair is shedding or breaking? Shed hair comes from the hair root. When you go several days or weeks without removing shed hairs. 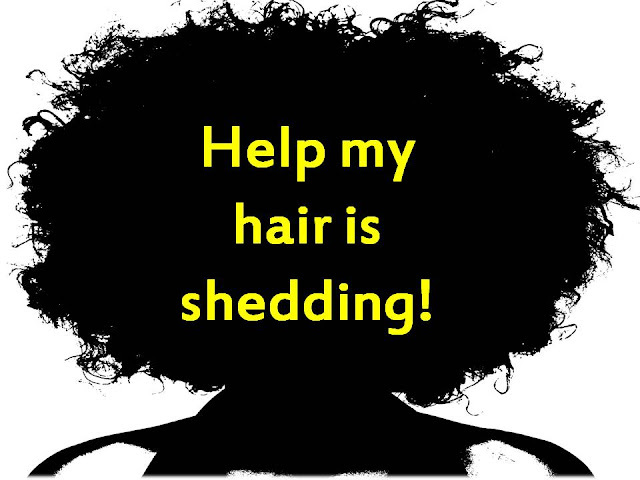 Lots of naturals panic over shedding when it is has been days or weeks since they have untangled their hair. Hair will shed daily and if those shed hairs are not removed then you will have an accumulation of naturally shed hair. That is natural and okay. Are hairs that are shorter than your natural length. They can be as small as an eyelash. You can usually feel breakage, you will have popping and snapping from simple manipulation. A BALL OF 10 SHED CURLY HAIRS LOOK LIKE MORE HAIR THAN A BALL OF 10 SHED STRAIGHT HAIRS. GET USE TO HOW SHED CURLY HAIR LOOKS SO YOU CAN STOP PANICKING OVER SHEDDING. PAY ATTENTION TO HOW MUCH HAIR YOU SHED DAILY, SO YOU CAN KNOW WHAT IS NORMAL FOR YOU. If your hair comes out in clumps. If your hair starts to shed more than what is normal for you. If you have detangled well, cleansed and conditioned, and your hair is still shedding. Stop manipulating your hair until you know the reason why. Treat the root cause of the excess shedding. Shedding comes from within so it must be treated internally. Garlic pills, hair growth supplements have been know to help excess shedding for some. These works when you have a vitamin deficiency. You will need your doctor to test your blood to know for sure. Consider medications you are taking that might contribute to excess shedding. Are you on your menstrual cycle? Wait until it is over before you panic. Odd things can happen during our cycle. Consider any type of stress you've had, in the prior 3 months. Do you have any other symptoms? Been sick lately? If excess shedding goes passed 3 days I would go to the doctor for blood work. There are many types of illnesses that can cause excess shedding. Do not guess, be safe and go to the doctor.